Canada’s Immigration Minister Ahmed Hussen touts ‘profound impact’ of Express Entry changes. When it comes to the future of immigration to Canada, it’s no longer a question of “why immigration” but “how much,” says federal Immigration Minister, Ahmed Hussen. “That’s where the debate is now,” he told his audience at the 2018 Canadian Immigration Summit in Ottawa. 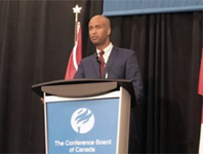 “Without immigration, our ability to grow our economy would become an impossibility,” Hussen said, referencing a recent report by the Conference Board of Canada. The report makes the case that an immigration rate of one per cent of Canada’s population by the year 2030 would help offset the challenges caused by an aging population and contribute one-third of Canada’s projected average annual real GDP growth rate of 1.9 per cent that year. “In a multi-trillion-dollar economy, that’s substantial,” Hussen said. In 1971, Hussen said there were six working Canadians for each retiree, a ratio that had dropped to 4:1 in 2012 and could drop to 2:1 by 2036 if immigration levels aren’t increased. “How would we maintain what we have with a ratio of 2:1,” Hussen asked, pointing to social programs like public health care and pensions as well as infrastructure. Canada’s multi-year levels immigration plan introduced last year, is responding to this mounting demographic challenge, he said, and will increase Canada’s immigration rate to 0.9 per cent of the Canadian population by 2020. “Sixty per cent of this immigration will be in the economic category to fill labour market gaps as well as skills gaps,” Hussen said. He also touted the “profound impact” brought about by changes to the federal government’s Express Entry economic immigration system introduced in late 2016 that saw the number of bonus points for a job offer reduced, among other changes. Immigration, Refugees and Citizenship Canada has said the changes significantly shifted the number of invitations for Canadian permanent residence issued through Express Entry in favour of candidates with higher so-called human capital scores, namely candidates in Express Entry’s Federal Skilled Worker Class. Immigrants now represent a significant portion of highly skilled labour in Canada, Hussen said, filling 50 per cent of all Science, Technology, Engineering and Math (STEM)-related jobs in Canada. Immigrant entrepreneurs, he added, are also helping create jobs – and the jobs of the future – in Canada. “Some of our most creative and innovative entrepreneurs are immigrants,” he observed. He told the story of a Cuban immigrant he met in Edmonton who had started a software company that is now one of the leading software companies in Western Canada and employs 150 people. On the topic of entrepreneurs, Hussen said recent immigrants now surpass Canadians when it comes to self-employment and business. “These businesses are more likely to sell their products to other countries, helping Canada to open markets for all of us beyond the United States,” he said.